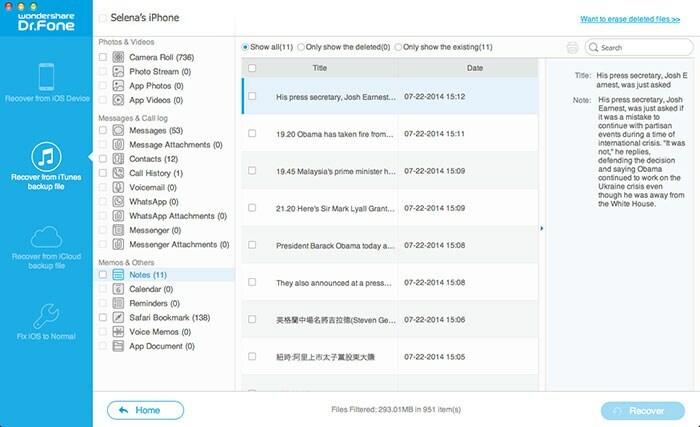 Lost your notes on iPhone/iPad/iPod touch and want to find it back? Well, it's not that difficult to recover deleted or lost notes from iPhone, iPad or iPod touch in fact. This article shows you how to recover your iPhone notes within 3 steps. Just read on. To get your lost notes, you need to download an iPhone notes recovery program. 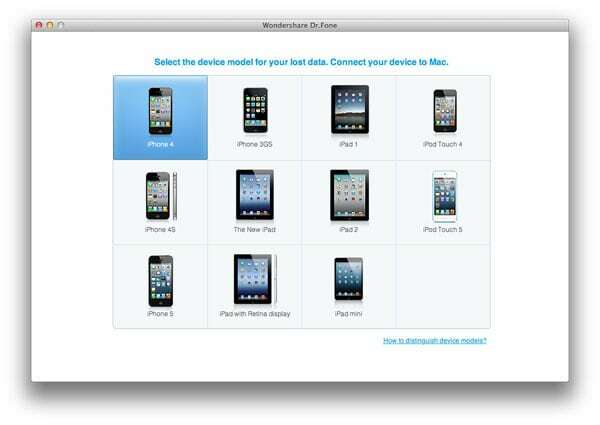 If you're still looking for one, why not try Wondershare Dr.Fone for iOS (Mac) or Wondershare Dr.Fone for iOS (Windows)? A trusted and user-friendly program allows you to directly scan iPhone, or extract iTunes backup files to retreive deleted iPhone note, as well as photo & video, text messages, call history and calendar, no matter you're using iPhone 5, 4S, 4, or 3GS. Download the free trial version below to recover your deleted video on iPhone. Try it for free! 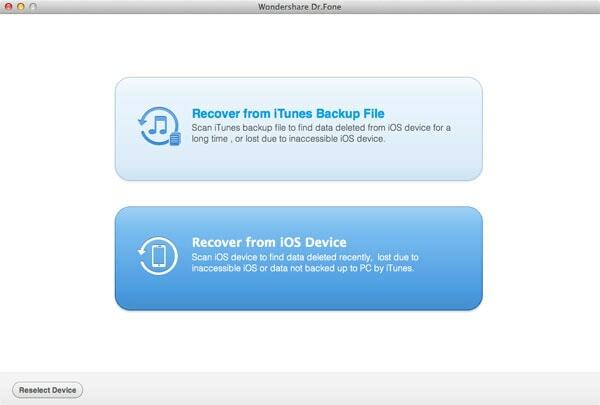 Next, let's take Wondershare Dr.Fone (Mac) as an example. After downloading and installing the program, run it on your computer. A main interface as follow will appear. 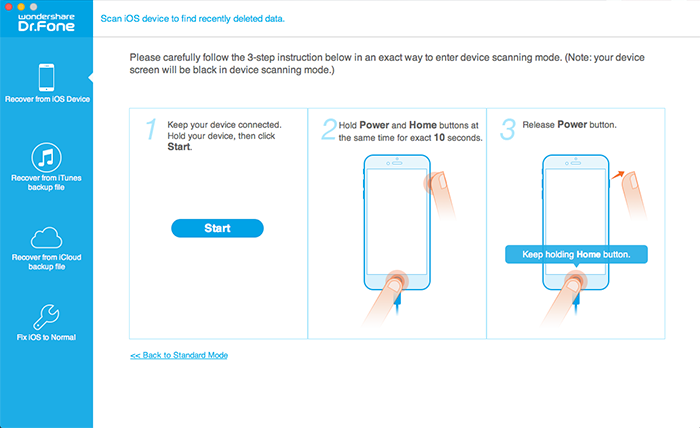 To start the recovery, you need to select your device type and recovery mode first. 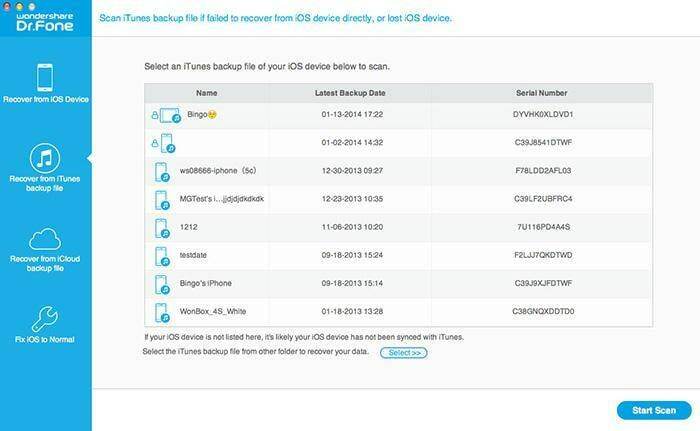 Select the backup of your iPhone and click "Start Scan" to scan and extract the specific contents in it. 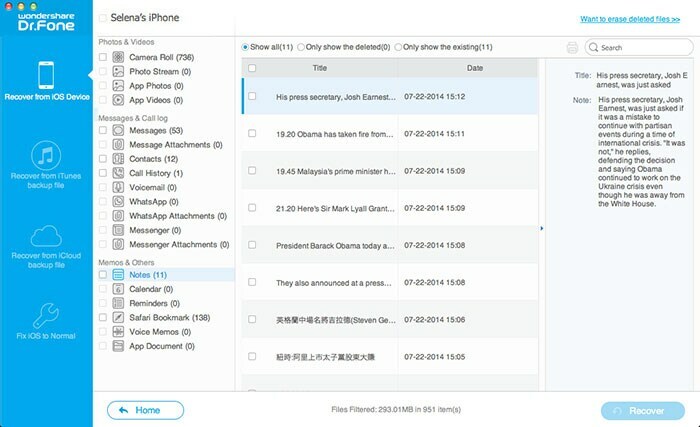 After the scan, you can check and preview details of your iPhone notes, and save them on your computer by clicking "Recover". Just as the interface above showing, this iPhone notes recovery software also can help to retrieve previous photos, videos, contacts, messages and call history on your iPhone, and you can recover them all with one click at the same time, if you have a need. Generally, every time you sync your iPhone with iTunes, the contents of your iPhone are automatically backed up by iTunes as a .sqlitedb file, which can't be viewed. This backup file is continuously updated along with every sync. Hence, First things first: Don't sync your iPhone with iTunes again now that you know your notes are lost, or the backup file will be updated and you can't get the lost notes back. If you're choosing this way to recover your notes, you should be an iPhone 4 or iPhone 3GS user. 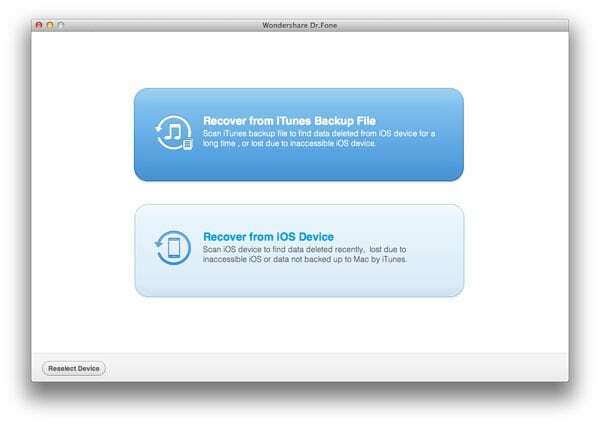 Because Wondershare Dr.Fone for Mac only allows you to directly scan iPhone 4 and iPhone 3GS, while Wondershare Dr.Fone for Windows enables you to do a direct recovery on iPhone 5/4S/4/3GS for lost notes. When getting the interface below after choosing your iPhone, select the second mode: Recover from iOS Device. Hold your iPhone and click "Start" button. Pressing "Power" and "Home" buttons simultaneously for 10 seconds. After 10 seconds, release "Power" button, but keep holding "Home" for another 15 seconds. After entering your iPhone system, the program will begin scanning your iPhone and find out all your lost and existing data on it. After the scan, you can preview the found notes one by one. Mark those you want and click "Recover", you can save them on your computer with one click.